Mensusa https://www.mensusa.com/articles/mandarin-collar-shirts-a-different-kind-of-formal-wear.html Mandarin Collar Shirts- A Different Kind of Formal Wear MensUSA.com offers a generous selection of mens designer dress shirts, including the mandarin collar shirts designs, to wear to your next event. Have you ever walked into the men's formal section and wondered why there are so many different styles and colors of what appear to be the exact same shirt? Look a little closer next time: sometimes, the difference is all in the collar. You might recognize the mandarin collar shirt if you look closely at the uniforms of U.S. Army members or members of the Catholic clergy. The reason for the growing popularity of the mandarin collar shirts is that it is secure and can cover more of your front without the need of wearing a tie. Mandarin collar shirt styles are available for both men and women and many choose to wear them as an alternative to other dress shirt styles, especially if they want to go more casual but still look sophisticated and professional. There are many different styles of men's dress shirts, and which style you choose depends entirely on the look you are going for whichever event or outing you are dressing up for. If you have already worn out all the other men's dress shirt style options out there, or you are just looking to freshen up your personal formal style a little, give the mandarin collar shirt a try. 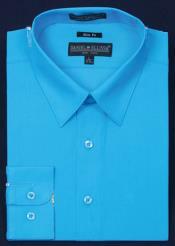 Banded collar shirts, unlike other mens designer dress shirts, do not have a foldable flap at their collars. The collar of the banded collar shirt stands up at the neckline. The mandarin collar gives the wearer a standing collar look, which can turn pretty much any outfit into an elegant, sophisticated ensemble. The front of the collar usually has either straight or rounded edges. The mandarin, or banded collar shirt is about as versatile as they come. It is thin and comes in many colors, and with its permanently turned up collar, it can go with just about anything or stand proudly on its own with a belt, trousers and great shoes to compliment it. 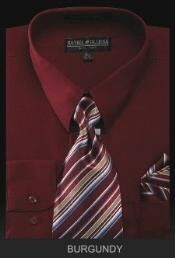 Because of the style of the neckline, banded collar shirts for men do not require that you wear a tie with them. 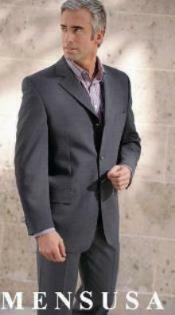 A mandarin collar shirt can be worn under a blazer or with a more formal suit coat or tuxedo jacket. Mandarin collar shirts come in many different styles as well. You can have a long-sleeved mandarin collar short (a full-length sleeve) or a shorter sleeved one if it is warmer out, so you are not limited to long sleeves and you do not necessarily have to worry about whether or not it is appropriate to roll up your sleeves.Depending on the season, you can also find mandarin collar shirts in thicker or thinner materials to fit whatever your current needs are. A mandarin collar shirt is one of the simplest and most versatile men's designer dress shirts out there. You can mix and match the mandarin collar shirt with different jackets and other accessories depending on the occasion and the kind of style you are trying to pull off. You can wear the mandarin collar shirt with a casual blazer or suit coat for more casual outings, but you can also wear it with a simple and stylish pair of jeans as well. It is the kind of collared shirt you can save for more formal events or incorporate into your everyday style if you really like the way it fits and feels and would feel comfortable wearing it every day. In more casual settings, it is completely acceptable to wear your mandarin collar shirt open at the neck with your sleeves rolled up. In some settings, this more relaxed look can be much more flattering than you might think. The mandarin collar shirt is a more laid-back but equally professional alternative to other dress shirt collar types, such as the club collar or point collar. It is an option to consider if you are looking to add a little unique touch to your style or if you hate taking the time to find a tie that matches your outfit. This shirt isn't just for priests or military personnel anymore. You can wear it as part of your business casual look or wear it in a more relaxed setting to keep yourself looking sharp yet laid-back. You choose the style and you can experiment with different types to figure out which kind of mandarin collar shirt works best for you.